Some coaches coach individuals, and some coach groups. Nicki does both—coaching many folks that she does not even meet in person—to step up and reach higher than they have before, opening their generous hearts while becoming volunteers for a very worthy cause. If you are considering undertaking a volunteer project, you will love having Nicki coach you through your stages of inspiration, project management, and implementation. Contact her at: nickimcclusky@earthlink.net or 314.432.2549. Watching the agony of Hurricane Katrina victims, Nicki could not abide seeing it any longer. “I went to my computer and wrote a letter to everyone I knew, asking them to join me in an effort to help our fellow citizens that were in terrible jeopardy, all along the Gulf coast.” Hence, “Adopt A Person” was born. Nicki’s husband, John, simultaneously arranged with/for the St. Patrick Center in St. Louis (the national model for dealing with homelessness) to be the collection and distribution site for “Adopt A Person.” Hundreds of people from the Gulf Area affected by Katrina came to St. Louis to start anew. Many came with only the clothes on their back. 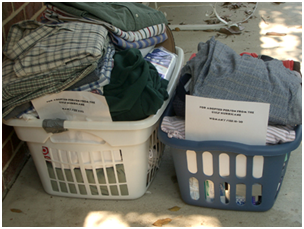 “Adopt A Person” became their “starter kit” for beginning again—with a box of clothing and sundries, prepared by someone just their size who cared about them—so they could have what they initially needed to begin again. Below, you will see the form sent to each participant who wanted to “Adopt A Person” or baby. People from all over the U.S., including a few individuals from Canada and Mexico, carefully packed good, useable clothing, shoes, coats, new sundries and new underwear, and shipped it to the loading dock of the St. Patrick Center. Many St. Louisans opted to drop their box off on the McCluskys’ front porch in Olivette; several van loads of boxes made their way down town to the SPC. This went on for weeks. Emails spread all over the country like a good, wonderful virus. “I got emails from every state, asking ‘Is this real?’ “ Of course people wanted to make sure this charity drive was legitimate. It was not only legitimate—it spread to Chicago. A lovely woman wrote and asked for instructions as to how to set this up in another city. 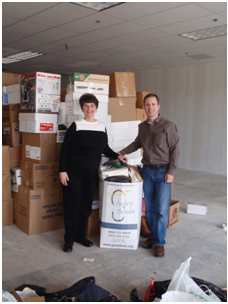 She utilized the Salvation Army for the distribution center, and a truck sales yard for the collection site. 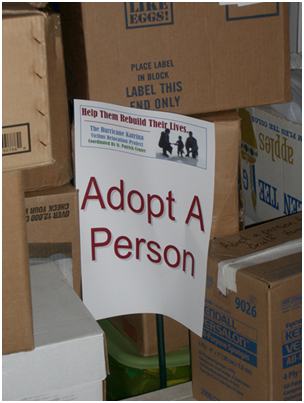 The same parameters were used for those contributing to the Chicago “Adopt A Person” as were utilized in St. Louis. Soon, “Adopt A Person” was listed on the St.Patrick Center website as an “Inititiative in cooperation with Catholic Charities;” people could access donation instructions from the web from that point on, and from Nicki’s office. danger and opportunity. “Whenever there is a crisis, we are given the opportunity to reach out to our brothers and sisters through extreme generosity and care.” “Sometimes people don’t know what to do, and with the assistance of a coach, they respond from strength of heart, purpose and soul in ways that surprise even them. Sometimes, people who want to respond in a crisis need someone to either inspire them or coach them, helping them live from their highest and best. Sometimes they simply need an example (or a coach) that shows them a pathway for service that they will love. St. Louis and the people from its surrounding areas donated over 40,000 pairs of shoes to Soles4Souls—the parent group that was the “ground” for our shoe drive in St. Louis benefiting earthquake victims in Haiti.” “They sent a semi to pick up our donations; the shoes went on to Haiti from there.